Mount Mantalingajan (or Mantalingahan or Mantaling) is located 140 km southeast of Puerto Princesa, the capital of Palawan. 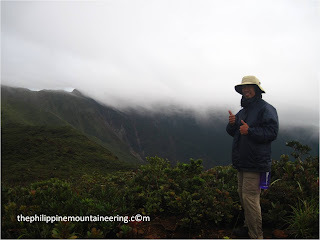 This is the highest peak of the Palawan province with elevation of 6,841 ft. (2,085 Meters above sea level). Its mountain range encompasses five municipalities, Quezon and Rizal on the eastern part. On the Western side are the Municipalities Sofronio Española, Brooke’s Point and Bataraza on the Eastern side. Landscape is bounded by Victoria Peak in the north and Mt. Bulanjao in the south. The local name of the mountain is Kabatangan. 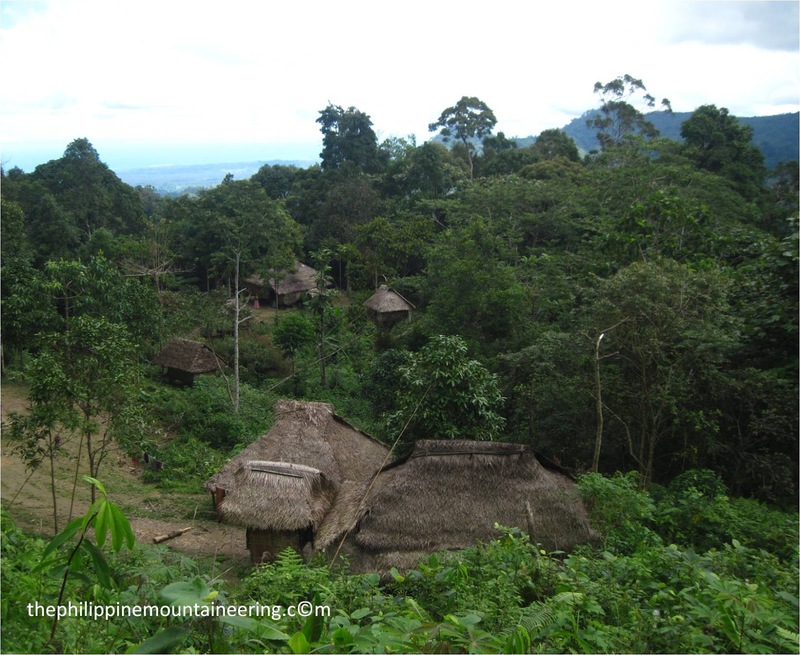 This is the haven of some Palawan tribes, Kunoy, Palau'an, Tawt' bato, Tawt' daram groups. The rugged mountain forms the center of the Mt. 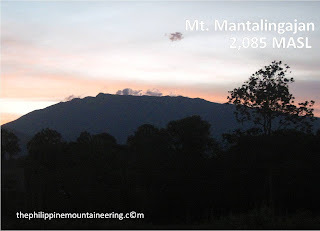 Mantalingajan Protected Landscape (MMPL), a national park covering the entire Mantalingahan Mountain Range. MMPL is now as protected area by the virtue of Proclamation No. 1815 by President Gloria Macapagal-Arroyo proclaimed last June 23, 2009. The protected area covers an area of 120,457 hectares. Palawan was one of the provinces I wanted to visit before. It is my dream to see the beauty of Puerto Princesa and see what’s with the beauty of this province that has attracted and keep on attracting local and foreign visitors. Travelling through attending seminars and assemblies is one of the privileges of being Pastor. The moment the National office of our denomination declared that this year’s Regional forum will be in the Palawan Province, my heart was full of joy because my dream of reaching the highest peak of Palawan is almost in my hands. It took me many months to find the right person to ask regarding Mt. Mantalingajan. I used to watch a documentary of the said mountain showcasing the newly discovered species of flora and fauna. With the help of Internet and with my curiosity to click albums of mountaineers on their climb, I saw the album of Mt. Victoria from Angela’s account and after few days I contacted her regarding their experience. I also asked her if she can recommend a guide for us for AMOS Mantalingajan climb. She told me to contact Jehson. Since September last year I keep on communicating with Jehson, telling him that I and my group will climb the mountain. He told to me that he is planning to have a traverse. According to him, that will be the first time for a group of mountaineers to traverse from municipality of Rizal to Brookes point. Also, for him it will take 6-7 days of serious walking. Early this year my group mates declined their intention of climbing Mantalingajan due to some valid reasons, and for me I have to continue because I already settled with Jehson the schedule and also the itinerary. The moment my group mates declined their participation, I looked at the possible expenses and truly I was shocked on how big the amount I have to raise just to fulfil this climb. I have to finish the climb schedule and not break my commitment with Jehson’s team. Praise GOD for providing me climb buddies for this journey through facebook. I used to post an invitation to Xplore regarding this challenge and a lot of individuals communicated to me but only Mark Mendes and Bong Magana were serious among them. Kuya Bong and Mark scheduled the same flight with me going to Puerto Princesa through Zest Air. We experienced almost two hours of delayed flight. We reached Puerto Princesa at almost 7:00 in the evening. Our agreement with Jehson is to meet him at his place, N.A.R.R.A., an hour or two-hour drive to South from Pueblo. One of the challenges of going to Mantalingajan jump-off is the transportation. Even going outside Puerto Princesa to nearby municipalities is difficult. The last trip of public utility vehicles going to N.A.R.R.A. is until 6:00 pm only. Since we arrived late, we had to make a choice whether to go to Jehson’s place via private vehicle or by renting a lodge within the city then travel to meet Jehson in the morning. One of the advantages of climbing with older brothers is having the availability of quality wisdom with regards to decision making. I agreed with their ideas of going at N.A.R.R.A. through private van. Our travel from Puerto Princesa via van is a turtle-like journey, it took us almost four hours to reach Jehson’s place. Early in the morning, we packed all our stuffs for the exploration climb. We already had our food supplies prepared prior to our arrival because we sent money to Jehson for him to buy the supplies we need. 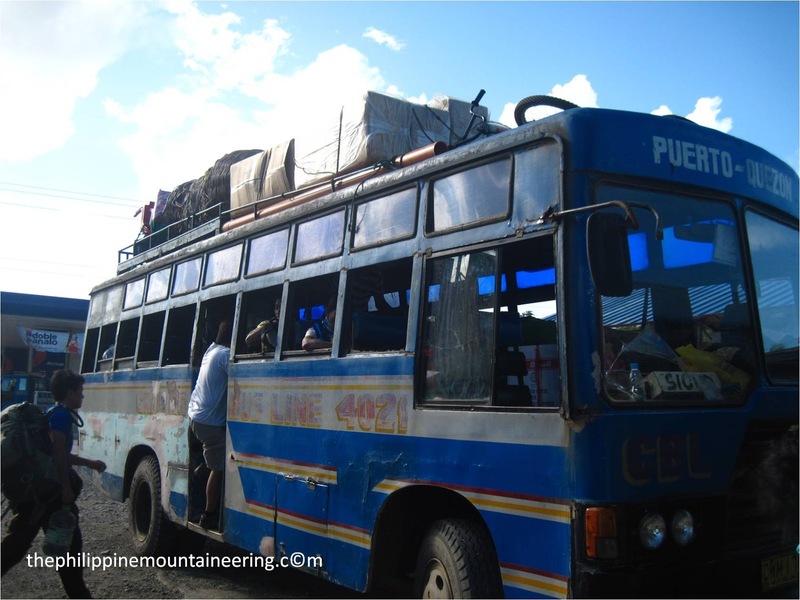 One of the highlights of this climb is to have a Charing bus ride. Aside from snoring seatmate, you’ll also be with hollow blocks, cement, urea, live chicken, goat, lots of rice socks, vegetables and other supplies. The journey from N.A.R.R.A. took us 7 hours before reaching Barangay Ransang of Rizal municipality. We registered in the logbook administered by Kagawad. While walking, drunken locals asked me where am I going? I told them that I’m going to Mantalingajan. One of them said he used to climb there but was not able to finish it due to strenuous trail. At the sari-sari store of Kagawad, we met our two local guides, Binoy (Justin Pogi) and Manong Dinyo. We need to have two local guides because Binoy, the son in-law of tribe chieftain will be carrying our supplies and Manong Dinyo will be our trail master on our traverse. We spent our first night in Balin- balin. We had our first night talking about malaria scares in Palawan. Personally, I was not scared. I did not even take any medication to counter the deadly disease brought by mosquitos. We also talked about the Reyster Langit’s cause of death because Binoy and Manong Dinyo were part of the team who brought Langit’s team to the Tau’t bato tribe. On that night, I learned that Mantalingajan is not under malaria but under bad labeling of non- Palawan residents. On our first day going to the summit, I enjoyed seeing rice fields and seeing local residents smiling every time I told them “I am climbing to reach the summit of kabatangan”. Mantalingajan is full of huge Palawan trees or the Tupaia palawanensis and other varieties of flora and fauna. It’s nice to have our guides within our reach for questions. I keep on asking them the local names of the trees, plants and animals I encountered. Jehson is an environmental scientist who used to work within Mantalingajan for several years as a part of environmental inventory. While Binoy and Mang Dinyo are expert on local names of the birds because they used to be a part of illegal wildlife trade. Manong Dinyo and Binoy are fun individuals to be with and responsible enough for guiding. Going to Talambukid, we reached the nipa hut of Buldog. We leave the betadine and some medicines for the fast healing of his deep and big wound. His place is a wonderful place for rest- there are plenty of red bananas and coconut trees. He also carved arrow gun which is good to use for fishing. 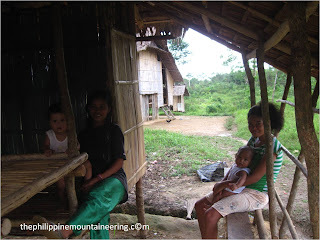 We encamped at Talambukid on our second night and experienced the painful bites of “antik.” Our third campsite was Kawayan but before reaching the said camp, we enjoyed eating cassava and some picture takings with the Tau’t daram tribe of Kabgan. With the help of Manong Dinyo, we had the opportunity to taste their yellow cassava and their spring water. Prior to our coming,the people of Kabgan were disturbed by a group of mountaineers who disrespect their community by getting water without permission, taking photos without local’s approval and the worst is pitching tent inside their worship area. The heart ache and sentiments of the Kabgan community extended to us through Pastor Kalbo. Pastor Kalbo is a distant relative of Mang Dinyo and his place is in Kamantian, a community near Brooks Point exit of the mountain. The pastor told us that the going to Brookes point was abundant of traps for wild animals and we have to be careful and let manong Dinyo to walk first to clear the trail for us. Our fourth day was a serious day of climbing, we had to reach Paray-paray campsite in spite of heavy rain. It was a tough day for us. There were lots of rattan and small bamboos along the trail. I personally got lots of scratches. Binoy is a strong one, he cracked jokes every time we’re tired and catching our breaths. One of the highlights of reaching Paray-aray from Kawayan is the trail called by Jehson and Binoy as “Bumba-borj,” literally pump buddy, because you have to pump you knees and breathe like pumping the deep well. The bumba trail was a great challenge for me. It tested my endurance and also my temperance- a long winding more or less eighty degrees of trail. We reached Paray-paray at 1:00 in the afternoon then took our lunch and encamp while raining. After two hours of raining we explore the campsite and got our water from the spring. The wind blew too strong. We enjoyed our dinner with the help of my Apexus tarp tent and the cover of Jehson’s hammock. We planned for our next day- to reach the summit then start the much awaited traverse. On our fifth day, we reached the summit at exactly 10:30 in the morning. At first there was zero visibility but after few minutes of waiting, we saw the 360 degrees above the summit. Reaching the summit from Paray-paray wass not that easy. 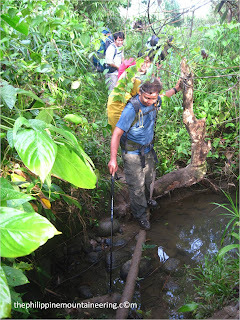 The trail is not yet established and still the presence of vegetation such as rattan and small bamboos were some of the challenges. Going to summit, we enjoyed looking at the bonsai trees and the rocky trail. The two-hour trek to summit from Paray-paray was enjoyable due to weather unpredictability, strong wind blow and the stiffness of the trail. From the summit, we decided to remain in Paray-paray as per Manong Dinyo’s advice, because he himself was not sure of our traverse trail. It was a tough condition for us, heavy rain and our food supply was about to lack but praise GOD we enjoyed the times when we experimented on our menu. We tried to have miswa in crab and corn soup but the most memorable is the champorado using 3-in-one coffee mixture as the base of taste and color. I think one of the memorable with kuya Bong was the lugaw with salted egg and adobo. congrats to your team sir Rotsapreb. i hope that i might also climb Mantalingajan in the future. thanks for appreciating rotsapreb's journey. help us in listing mountain experiences and also to have updated and realistic itineraries.